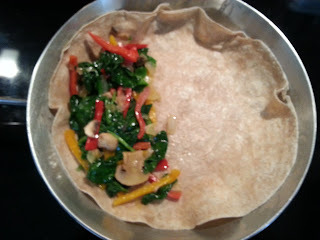 Feeling Veggie Good: Veggie Quesadillas -- It's What's for Dinner! One of the things I have most enjoyed about being a vegetarian is the opportunity to try healthier versions of favorite foods, such as quesadillas. Anticipating a trip to the grocery store after a day at the office, I craved a delicious but easy-to-make meal that would satisfy my hearty appetite. 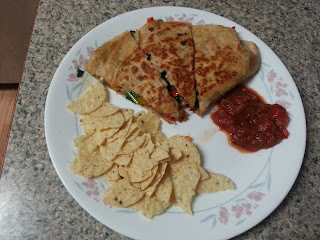 Veggie quesadillas fit the bill! I'll be the first to admit that I am no chef or photographer. But I am a person who loves good food and simple recipes. Hope you enjoy this one. Feel free to vary the ingredients and put your own spin on these veggie quesadillas, and enjoy the good feeling you will have when you have enjoyed this nourishing and tasty meal! Shredded non-dairy (vegan) mozzarella cheese -- We like Follow Your Heart cheese! 1. 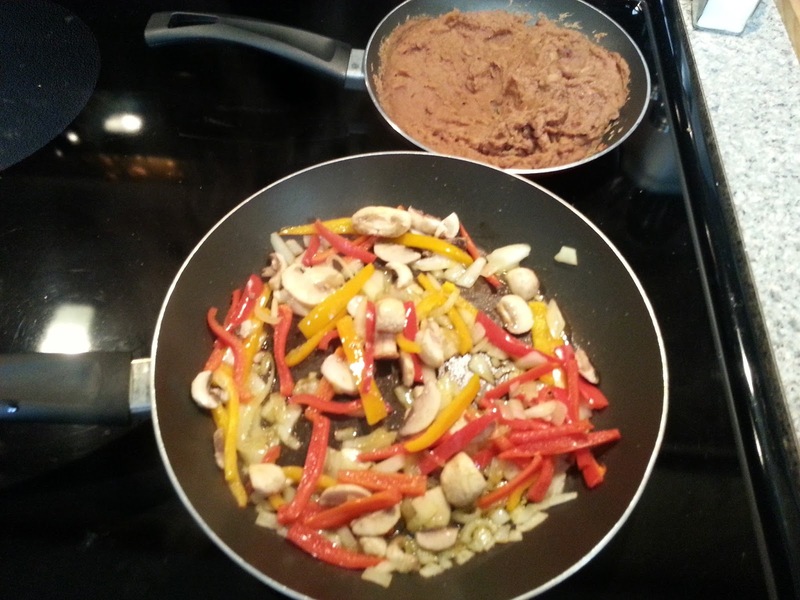 Saute onions, peppers, and mushrooms in non-dairy butter until onions are clear and vegetables are still slightly firm. 2. 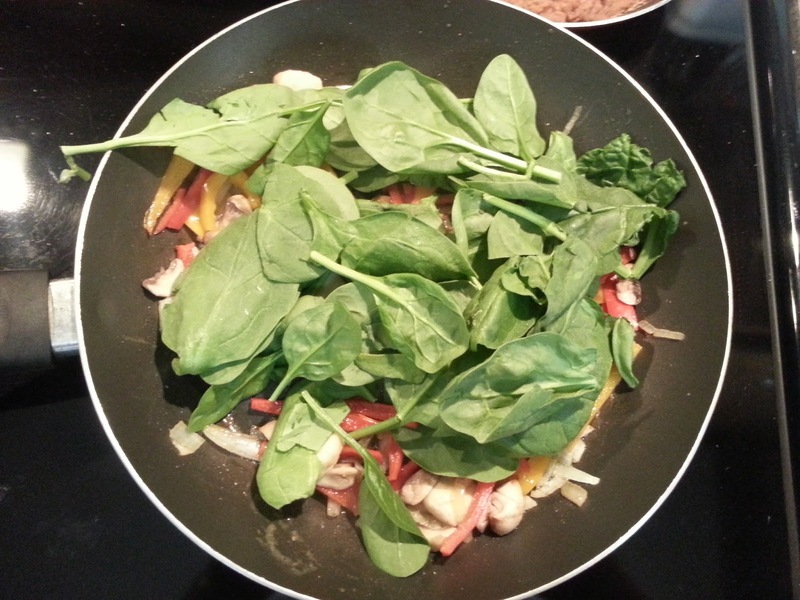 Add spinach and stir together with other vegetables. 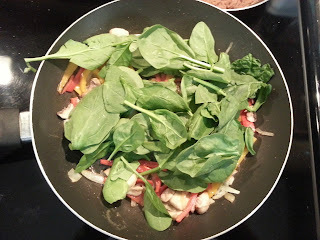 Remove from heat as spinach begins to cook down. 3. In a separate saucepan, melt just enough dairy-free butter to coat one side of a tortilla. Place tortilla in sauce pan and spoon vegetables over one half. 4. 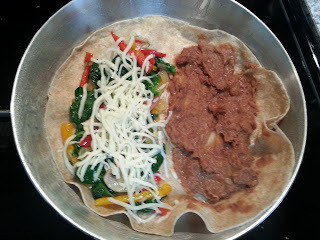 Spread refried beans on other half of tortilla, sprinkle cheese over veggies and/or beans, and fold over. 5. 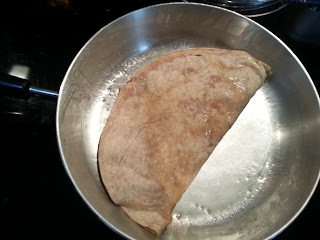 Cook quesadilla on medium heat, turning every couple of minutes to prevent burning. 6. Cut quesadilla into triangles and serve with favorite sides, such as Mexican rice, quacamole salad, or chips and salsa (pictured below). Enjoy!